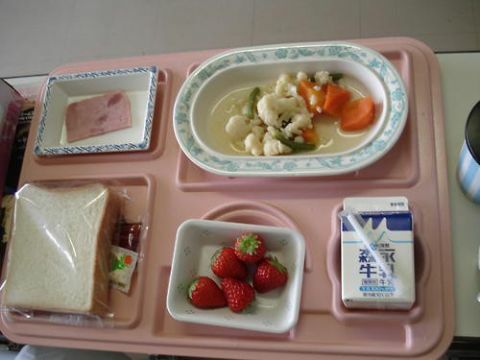 In Japan, school lunches are called "kyushoku". In most public elementary schools in Japan, the teacher and students have lunch together in the classroom. They also do not pack lunches nor buy them but are served by the school. The lunch ladies prepare the lunch for everyone and the students go to the kitchen room to pick up carts racked up with pots of food. The students that are on lunch service duty for that day will then serve their teacher and fellow classmates, cafeteria style. The lunch menu varies daily and is not just a simple plain sandwich or a bowl of rice. In fact, the nutrition and balance of diets is thought out carefully by the school and lunch ladies. Lunches will include a main dish like curry, cold noodles, beef bowl, and fish, a side dish like salad, soup, or vegetables, and fruits or desserts.